The Comfort Quilts committee of the Tehachapi Mountain Quilter’s Guild makes quilts for children’s hospitals, spousal abuse centers, homes for the elderly, etc. 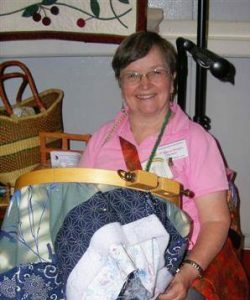 They have made hundreds of quilts over the years. Our friendship group, which is a part of the guild, has also made quilts that are given to veteran’s hospitals and homes every year. I am not as prolific as some of the members, but here two quilts I have put together for this year’s donation. 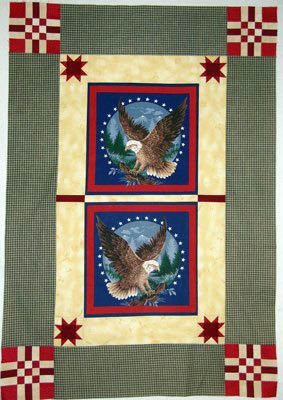 I found the four eagle squares as a panel at the local thrift store and repurposed some orphan blocks for the corners and the light colored border. The blocks came from my Woven Quilt, that was in the book A Thread Runs Though It. Instead of making it rectangular, I decided it was better as a square, so the blocks were tucked away. Thought this would be a good use for them. 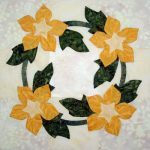 There were not enough of those small squares for the inner border corners for the second quilt, so I made small stars using Sewfasst®Flying Geese. 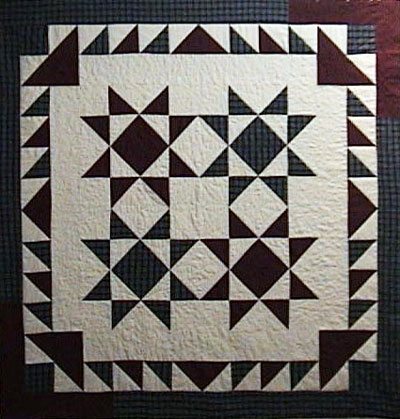 With this technique it is easier to make a block with small pieces. Those stars finish at 4″. 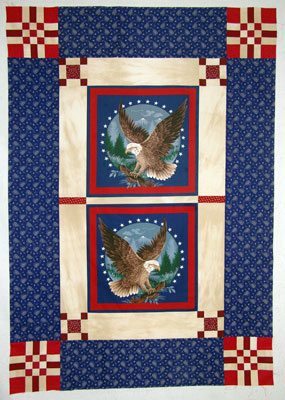 The light fabric strips around the eagle blocks was close enough in value to the fabric in the outer corner blocks. 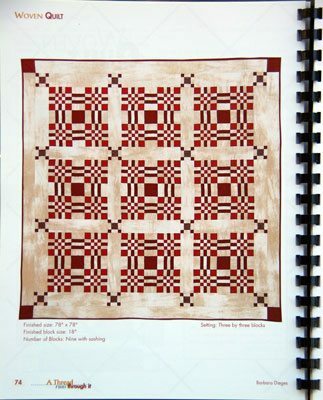 Each quilt measures 40″x56″. Now I just need to machine quilt and bind them. 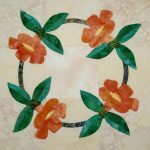 I figured if I get the tops done, then I can set up the table for quilting and get these done as well as a couple other quilts that have been nagging me to finish them. Below are two other veteran quilts that I have made and given away in the past. 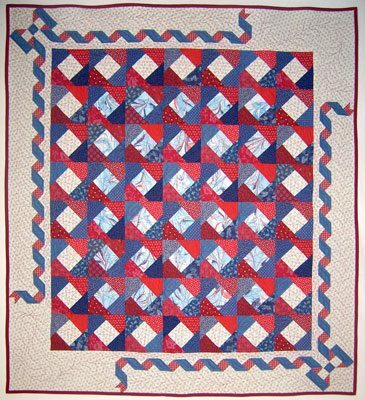 This woven flannels quilt, uses my favorite block, if you haven’t figured that out by now, the Sewfasst®Star, made with Flying Geese and Squares on Point. 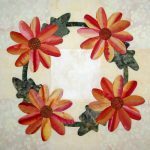 And this one uses my ribbon pattern for the border and an interlocking block. The design for the block, came from a tile floor in Europe. I saw it so long ago, that I have forgotten where it was. It may have been in Italy. The blocks are made with partial seaming techniques. With the square in the center, it makes a great autograph block too.